Had they lost last night, the Dodgers let it be known, they would have considered starting Clayton Kershaw tonight in what would have been an elimination game. 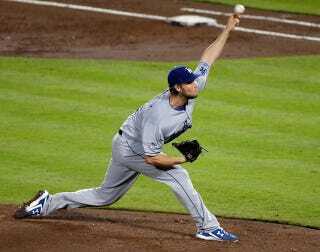 Sensible enough—Kershaw is the best pitcher in baseball, after all! No reason not to start him in an elimination game. But then they went out and whipped the Braves, making it an elimination game for Atlanta ... and now the Dodgers have decided to go with Kershaw anyway. Pitching coach Rick Honeycutt told the Los Angeles Times after last night's win that Ricky Nolasco, tonight's originally scheduled starter, would take his turn in the rotation. Nolasco, a righthander who last pitched Sept. 29 (in a relief appearance), went 0-2 with a 12.75 ERA in his last three starts. Having him start tonight instead of the lefthanded Kershaw would allow Kershaw to be available in case there's a Game 5 in Atlanta on Wednesday. And Kershaw has never made a start on three days' rest, as he will tonight. Honeycutt even cited this as a reason not to start him in a game his team can afford to lose. "He's our future," Honeycutt said, per the Times. "You don't want to mess around with it." Kershaw, who's won three straight National League ERA titles, allowed one run on three hits in seven innings in Game 1. But the risk here appears to outweigh the potential benefits: He just threw 124 pitches on Thursday, and will presumably be on a limited count tonight. Mattingly is banking that the Braves can't beat him. At least if his bet goes wrong, he'll have Zack Greinke available if the series goes to a Game 5. Money changes everything.